Flip Out Mama: Ecover Review and Giveaway! I recently had the chance to review a product for a company called Ecover. I had never heard of this company before, but I am so glad that I discovered them, because they have some really great products! They have TONS of eco-friendly products for every area of your home. I got a chance to review the Ecover Laundry Wash. The Ecover Laundry Wash is made to be extra gentle on your skin, and made to help keep your colors bright. It is compatible to use with HE machines. The Ecover Laundry Wash is made with plant based igredients, and is made to have a minimum impact on aquatic life. Ecover products are never tested on animals, and are safe for septic tanks. 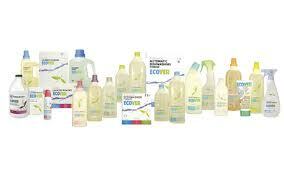 Ecover products are made using new pioneering ingredients, and state of the art technology. You guys know I am always worried about Eco-Friendly products, how well they will perform, and how they will smell. I was very impressed with the laundry wash! It smells really good, fresh, and clean. It smells "natural", but still smells "clean". I was also very impressed with the way that it cleaned my clothes. It got all the stains out of Bean's pukey baby clothes. :) They all came out clean, and smelled really fresh. I actually ran out of fabric softener, so I was washing clothes with just the Ecover detergent and nothing else, and BD was like "did you do something different? These clothes smell way better than normal!" So, that should tell ya lol. Would you like to win your own Laundry Wash from Ecover? They are sweet enough to give away a bottle to one lucky Flip Out Mama reader! Yay! Mandatory Entry: Go to Ecover's website and tell me about another product you would like to try. (for extra entries, make sure to leave a separate comment for each entry to make sure they all get counted properly. each of these is worth one extra entry. tweet about this giveaway/blog about it/post it on your Facebook. Leave the link to this post in your post. come back here and leave 5 comments telling me where you posted. This giveaway will end on 11/18/2010 @ approx 10pm. Winner will be chosen via random.org and will have 48 hours to respond to email or a new winner will be chosen. Please don't be a cheater, they never win! :) Prizes will be shipped directly from the company, and I am not responsible for prizes that are lost/damaged/not received. US only please. disclosure: I received a sample product in order to complete this review. Although I received a product, all opinions are my own, and no monetary compensation was given. I am a new follower. I hope you will follow me too. I'd like to try the Ecover Delicate Wash because I have lots of things that need to be washed by hand. I would like to try the fabric softener he. I'd like to try the Ecover Rinse Aid. Ecover Twitter follower as jennem1. I'd love to try the Cream Scrub. I would like to try the Car Glass & Interior Cleaner. I'd love to try the Limescale remover. oops last post was on wrong giveaway, can you delete it? We are so happy to hear that Ecover's ecological Laundry Wash did the job well (and maybe even better than your traditional product)! We are also thrilled to know that your little one will no longer have "pukey" stained clothes! Thanks for sharing the positive feedback. I would love to try their handsoap! I am a facebook fan of Ecover. your new GFC follower as "sswpss"
Hi there! I would like to try the all-purpose cleaner...I think using eco-friendly products is most important on surfaces you touch all the time, especially with kids around! I'd like to try their cream scrub. I would like to try the stain remover! I would like to try the Heavy Duty Hand Cleaner for my son. I'd love to try the dishwashing tablets. I now follow Ecover on FB. I was already following Ecover on Twitter. @longwait4bella is my username. I now follow you on Twitter. @longwait4bella is my username. I would like to try Cream Scrub. I'd like to try the Lemon & Aloe Vera Dishwashing Liquid. I'd love to try the Grapefruit & Green Tea dish soap! Thanks!